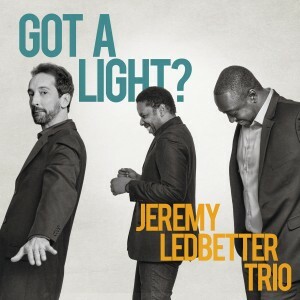 The Jeremy Ledbetter Trio’s debut album, “Got a Light” — now available everywhere. Forged in a cauldron of raging, inspiring contemporary jazz, the Jeremy Ledbetter Trio features three Canadian virtuosos — pianist and bandleader Jeremy Ledbetter (CaneFire), drummer Larnell Lewis (Snarky Puppy), and bassist Rich Brown (rinsethealgorithm) — at the absolute top of their game. Ledbetter’s compositions for the trio format push the boundaries of jazz and world music, and provide an undiluted display of the astonishing musicianship of the Trio’s members. Audiences must exercise caution. People who see this band are rarely the same again. If the Jeremy Ledbetter Trio was an inanimate object it would be a runaway train. Eight of the songs are Ledbetter’s original compositions, plus a cover of “Gift Shop” by The Tragically Hip as a tribute to the great Gord Downie, recorded a week after his passing. Venezuelan world-jazz diva Eliana Cuevas makes a guest appearance on “Her New Wings”, and the exquisite “Suspirito” features a duet between Ledbetter’s piano and Reimundo Sosa on Afro-Cuban batá drums. Thanks for supporting live music! Don’t forget to Like us on Facebook to stay up to date with everything new!